MARYBOROUGH'S MURALS: Benjamin Higgins or 'Mr Mupz' is an artist whose practice spans murals, street art and illustration. 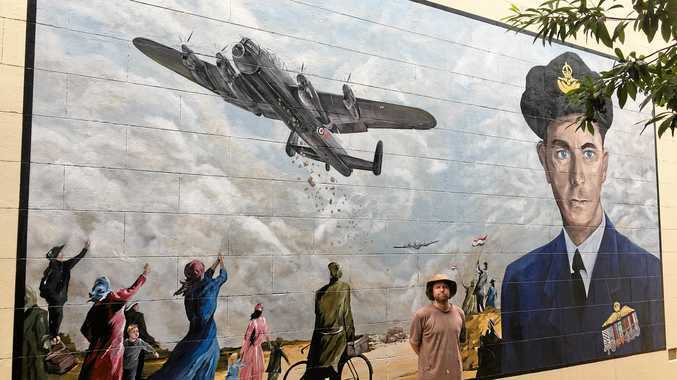 A PORTRAIT of Maryborough's most decorated serviceman during World War II is the subject of the Maryborough Mural Project Charity's most recently completed mural. He was Frank Lawrence DFC DFM. "One of Flight Commander Frank Lawrence's proudest moments was his participation in Operation Manna, dropping foodstuffs to the Dutch starving in the Netherlands", said Elizabeth Lowrie, a founding committee member of the charity. "Operation Manna flew a total of 139 Manna sorties between 30 April and 7 May to the Rotterdam area - a total of 343,350 kilograms of foodstuffs were dropped. "This is the third and final mural for our southern museum wall," said John Meyers, a director of Maryborough's Military Museum. "It completes our partnership with the charity - the other two are the Battle of Long Tan mural and the Tubby Clayton mural. Three excellent pieces of art with a story to tell. They fully represent Maryborough's participation in Australia's war years, World War I and II and the Vietnam War." Benjamin Higgins or 'Mr Mupz' is an artist whose practice spans murals, street art and illustration. His primary media include aerosol, acrylic, ink and watercolour. Painting for the past 16 years, he has produced and exhibited a vast array of artworks - from walls to galleries - both around Australia and overseas. With his diverse art skills and influences drawn from surrealism, magical realism, nature, wizardry, and beyond, his style continues to delve into the unexplored depths of his imagination. The Maryborough Mural Project Trail is comprised of over 30 murals and installations - an easy two-kilometre walk around Maryborough's CBD. A fantastic weekend activity! If you have not already seen it, drop into the Town Hall Visitor's Centre for a self-guided map. Map pads for accommodation venues to hand out to their visitors are available from Fraser Coast Opportunities and Events. If you like what MMP does, be a volunteer or send your donation to: Maryborough Mural Project - BOQ - BSB:124080 and Account No: 22621596.